이 철조약사여래좌상은 일제강점기까지 강원도 원주시 학성동(읍옥평) 들판에 방치되어 있던 다섯 구의 철불 가운데 하나로 현재 국립춘천박물관에 전시 중이다. 불상은 전체높이 110cm로 등신대(等身大)에 가깝고, 어깨는 둥글게 처진 모습이며, 신체 비례가 살아있는 사람과 흡사하다. 조형적으로 우수하고 보존상태가 양호한 나말여초기의 불상으로 철불의 제작기법 뿐 아니라 당시 유행했던 약사여래의 도상을 알려주며 원주지역에서 유행했던 조각양식을 보여주는 중요한 작품이므로 한국조각사에서 차지하는 중요성이 매우 크다고 생각된다. 그러므로 국가지정문화재 보물로 지정하여 보존하는 것이 바람직할 것으로 판단된다. 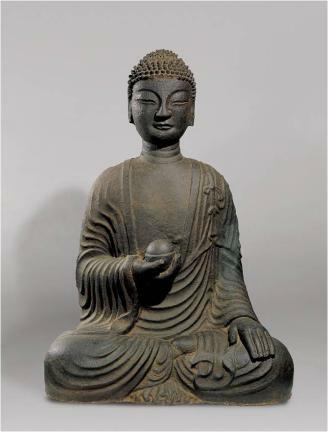 This iron statue of Bhaisajyaguru Buddha currently on display in Chuncheon National Museum is one of the five iron Buddhas that were found abandoned in a field in Hakseong-dong of Wonju-si, Gangwon-do. It is almost life size (height: 110 cm) and features round and slightly drooped shoulders. Due to its artistic excellence, good state of preservation, and its rarity as an example of iron work, the statue is considered a valuable source of knowledge about the production of iron statues and images of Bhaisajyaguru Buddha in the fourteenth century.